I want to apologise for the laziness, not because I’m bored of blogging but I am absolutely blanked with what makeup I would like to show. I’ve been doing looks but I absolutely hate them or they don’t turn up like I want them too, thus I have nothing to share. Anyway I stress first thing that everything I mention today is bought with my own money and they are not sponsored/free from Jesse’s Girl. I was not paid to do this review or show these swatches and everything here is based on my own opinion and experience with them. Therefore they may not be the same as other people who had already reviewed or swatched them. There are 6 shades in this series and each one cost US $4.49 each or you can get it in a set of 6 for US $24 (which is what I did). I actually bought these ages ago and put them aside to use another day and to share some swatches, but I cleaned the whole vanity and put them in the drawers…. Then I forgot them :p bad girl I am! I find the packaging quite cute with a little bling star on the corner of the lid and a bonus for me is always a clear lid! That way when I do reach for them I can see which colour it is without having to open all of them to see. The plastic is not that thin flexible stuff and it feels really sturdy and strong, so I like that very much. Just beware though that all of these shades are shimmer/glitter shades so if you’re not a fan of that then these are definitely not for you. In the end I did find that the shades it was limited was a bit small, so hopefully in the future there will be more colours to choose from. The pigmentation of these eyeshadows is amazing! I love them and even without a base under them they are great. The black (Galaxy) without a base is a little on the powdery/chalky side but with a base it is wonderful. The eyeshadow is really soft and smooth so when you apply it, it doesn’t feel chunky or chalky and they blend fairly easily as well. Check out the photos for the swatches and you might just see what I mean. Can you buy them anywhere other than the website? Wow such great colours. I need to get to Rite Aid one of these days and check out this line. 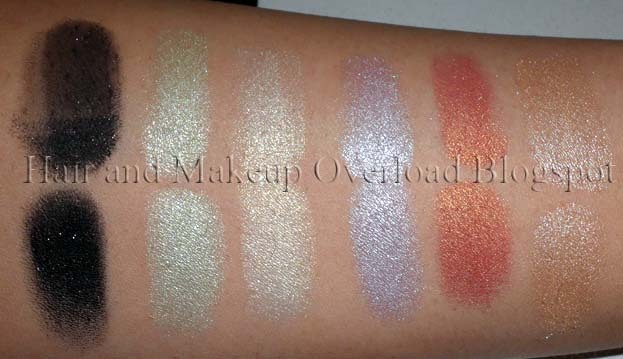 The swatches are very nice! I might have to go check these out! hey these eyeshadow are just amazing!! 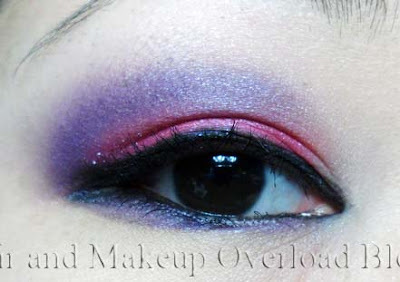 i make use of Jordana eyeshadows..next time will try this. Awesome blog!! this is really a nice post.. i am looking froward to see more such posts..
All of the shades are really awesome.I like the peach color very much.